Sandwiches may sound boring, but if you’ve ever had a really, really good one, you know they can be a pretty luxurious meal. Looking for a top recommendation? We vote for a hoagie. If you can say one thing about Italians, it’s that they know how to do food right. But that’s only if you’re eating the real deal. If you’ve been getting an Italian-style sandwich from a chain restaurant, for example, your head is probably going to explode when you try a real Italian hoagie with authentic ingredients. 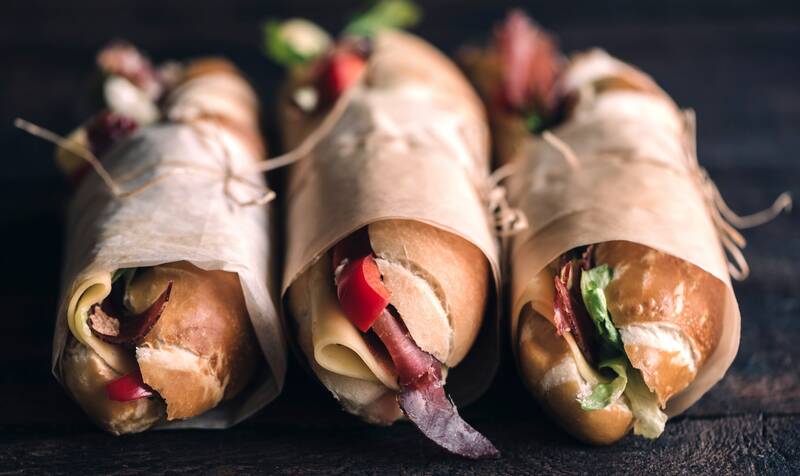 To keep it a classic Italian hoagie — and this might make some of you mad — you’ll need to hold the mustard, hold the mayonnaise, hold the bacon, pickles and sliced avocado. Because honestly, they just don’t belong here. You can stuff your Italian hoagies with as much meat and cheese as you like, but we’ve found that 1/4 pound of each meat and cheese above yields about two good-size, well-proportioned hoagies. And don’t worry, you can still serve your fave sandwich with chips and an ice-cold drink. Slice the rolls horizontally, being careful to not slice all the way through. Open up the rolls, and layer on the ham, capicola, provolone cheese and Genoa salami (about 4 slices each). Top with lettuce, tomato slices, onion, 1 tablespoon of oil, 2 teaspoons of vinegar, salt, pepper, oregano and peppers, if desired. Slice and serve.